August 9, 2017 – Harris Corporation has delivered the third of 10 advanced navigation payloads to Lockheed Martin, which will increase accuracy, signal power and jamming resistance for U.S. Air Force GPS III satellites. The advanced navigation payloads feature a Mission Data Unit (MDU) with a unique 70-percent digital design that links atomic clocks, radiation-hardened computers and powerful transmitters – enabling signals three times more accurate than those on current GPS satellites. The new payloads also boost satellite signal power, increase jamming resistance by eight times and help extend the satellite’s lifespan. The payload is expected to be integrated into GPS III Space Vehicle 3 (GPS III SV03) this summer. 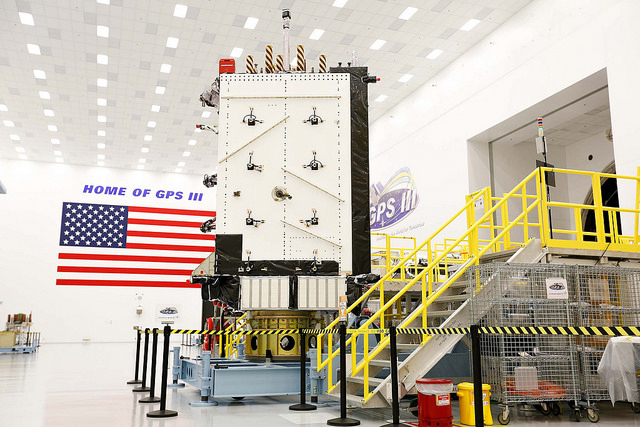 In May, Harris’ second GPS III navigation payload was integrated into GPS III SV02. The first navigation payload is integrated aboard GPS III SV01, which has now completed rigorous testing and is in storage awaiting its expected 2018 launch. Harris has a long legacy of expertise in creating and sending GPS signals, extending back to the mid-‘70s – providing navigation technology for every U.S. GPS satellite ever launched. Harris is also developing a fully digital MDU for the U.S. Air Force’s GPS III Space Vehicles 11+ acquisition. This new MDU will be demonstrated in fall 2017 and provides even greater flexibility, affordability and accuracy versus existing GPS satellites.